FRANKFURT -- Daimler CEO Dieter Zetsche vowed to beat BMW in luxury-car sales with a slate of new Mercedes-Benz models aimed at reversing the carmaker's slide in market share. "Our company is on the way to its best form, but is not there yet," Zetsche said today in a speech to shareholders at the company's annual meeting in Berlin. "We are confident that we can do more, and that also applies to the share price." The annual meeting marked the last opportunity for Zetsche to sell his strategy to shareholders before his contract comes up for renewal. The 58-year-old executive, who heads the Mercedes car division in addition to his job as Daimler CEO, is rolling out models such as the entry-level Mercedes A class hatchback and new variants of the S-class flagship in a bid to reclaim the luxury-car lead that Daimler lost in 2005. The new vehicles are aimed at boosting sales growth, which averaged 1.4 percent over the past 10 years compared with 6 percent at BMW and 7.4 percent at Audi, according to data from IHS Automotive. The sluggish expansion caused Mercedes's share of the high-end car segment to slump to 21.4 percent last year from 25 percent in 2001. "We aim to be the front-runner wherever we compete on a permanent basis," Zetsche said. "Wherever we are not number one, we will strive to become it." 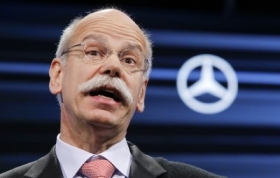 Zetsche stuck to his goal to increase sales and match 2011's record earnings before interest and taxes of 9 billion euros this year, adding that 2012 will be a "transitional year" for the company. "One can justifiably speak of a lost decade for Daimler," Ingo Speich, a Frankfurt-based fund manager with Union Investment, said in a speech at the meeting. "The once smaller competitors have overtaken Daimler and are making life for the one-time top dog difficult." Before the meeting, Stefan Bratzel, director of the Center of Automotive Management at the University of Applied Sciences in Bergisch Gladbach, Germany, said: "Zetsche has identified the weaknesses and is heading in the right direction, but the competitors are ambitious too. It will be difficult for Mercedes to catch up. A successful launch of the A class will be a litmus test for the strategy." Mercedes plans to roll out the youth-oriented A class in September to compete with BMW's 1 series and Audi's A3 and attract new customers to the brand. The sporty A class is one of at least five new small cars, including the four-door CLA coupe and a compact sport-utility vehicle, which will be based on the Mercedes new front-wheel-drive architecture to lower costs. Daimler's car unit intends to lift its operating profit margin to at least 10 percent of sales in 2013 from 9 percent last year. Mercedes is targeting an all-time sales high this year. Deliveries in the first quarter rose 12 percent to a record 340,900 vehicles, boosted by orders for the new B-class. The entry-level offerings will be balanced by the CLS Shooting Brake, a wagon-like variant of the $71,300 four-door luxury coupe, and three new derivatives of the S-class executive sedan, which will be overhauled next year. Zetsche took charge of the Mercedes car division in September 2005 and three months later became group CEO. His current contract expires at the end of 2013. Daimler's supervisory board historically decides on extensions to executive appointments in the final year of their term. Since Zetsche took control in 2006, shares of the company, which also makes Freightliner trucks in the U.S. and Fuso vehicles in Asia, have risen 6.5 percent compared with BMW's 84 percent surge. Zetsche succeeded Juergen Schrempp, who left following the unraveling of efforts to create a global auto giant with car and truck units in Europe, the U.S. and Asia. The current Daimler CEO, identified by his walrus moustache and round glasses, led Daimler's Chrysler unit from 2000 to 2005, introducing models such as the PT Cruiser and 300 in an effort to turn around the U.S. automaker. After returning to Stuttgart, Zetsche initiated Chrysler's disposal in April 2007 and completed the separation in April 2009, shortly before the automaker's bankruptcy. Last year, Zetsche decided to wind down the ultra-luxury Maybach brand, which sold vehicles costing more than $350,000, to focus on the S class line. The 1930s era marque was reintroduced in 2002 to rival BMW's Rolls-Royce and Volkswagen's Bentley.